According to Activision, the beloved purple dragon, Spyro, is "the roast master." I'm honestly not familiar enough with the character -- outside of his headlining participation in the Skylanders toys-to-life franchise -- to know where that came from or whether it's legit. 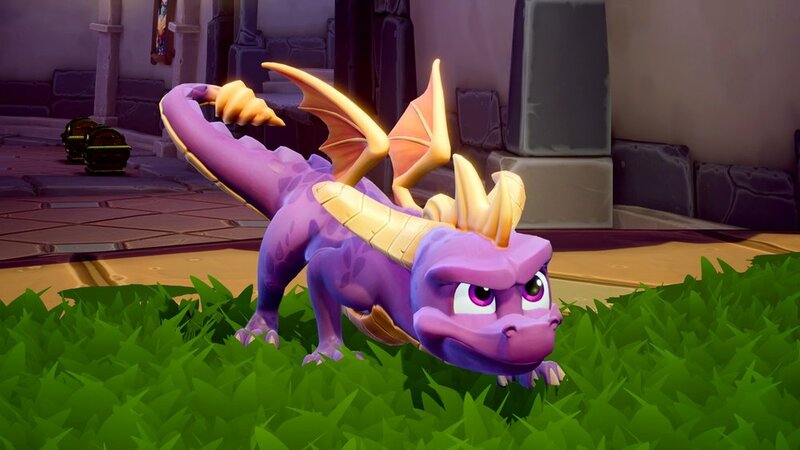 Still, he's going to be "unleashed" as one of the few survivors of the Great Videogame Mascot Wars, all "scaled up" and "ready to flare up some bad guys," in Spyro Reignited Trilogy, a collection of the first three Spyro games remastered, as is the tradition these days, for current generation consoles. The remaster job is being done by Toys for Bob, the California-based studio that handles Skylanders, and will feature improved environments, updated controls, brand-new lighting and recreated cinematics. "We're deeply passionate about staying true to the legacy of the original three Spyro games,” said Toys for Bob CCO Paul Yan. “We've poured a lot of love into making the personalities and worlds feel just like fans remember them, while also keeping the game collection surprisingly fresh with lush, high definition detail. We're bringing back the Spyro we all fell in love with 20 years ago." That extends to the soundtrack by Stewart Copeland which is of course, being remastered and the return of Tom Kenny as the voice of Spyro. As a little tip of the hat to gaming history, Activision announced that starting Monday, April 9, owners of Crash Bandicoot N. Sane Trilogy in Europe, Australia and Latin America on PlayStation 4 can enter the iconic code (↑ ↑ ↓ ↓ ← → ← → square) into their controllers on the title screen for Crash Bandicoot 3: Warped to watch the Spyro Reignited Trilogy trailer. Spyro: Reignited Trilogy comes to PlayStation 4 and Xbox One on September 21, in time for the series' 20th anniversary. Chairman of SIE Worldwide Studios Shawn Layden gives more details on Sony’s decision to pull the PlayStation brand out of E3 2019. PSN users will be allowed to change their name early next year. These Silent Hill 2 features are only available on a save file that has completed the notorious Dog Ending. The God of War Limited Edition PS4 Pro pattern was inspired by Kratos' weapon of choice in the new game. If you're looking for a good deal on games for your PlayStation 4, then a pair of new Dual Packs from PlayStation Asia might have you covered. A Monster Hunter World limited edition PS4 Pro that fans might want to consider. Full schedule for the big press conferences planned for E3 2017 and where to watch it. In this special, our focus is Sony's press conference and they yet again revealed a solid lineup to wow the crowd. Did it win yet again? We do a breakdown and discuss!